This Complete Lamrim MP3 contains 17 meditations on the Lamrim, composed and read by Ven. Karin Valham. 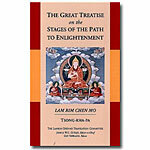 Each track contains a motivation and preliminary prayers including "The Foundation of all Good Qualities" by Lama Tsongkhapa. For details click here. Karin Valham has been teaching meditation courses at Kopan Monastery for the past 15 years. She is a nun in the Tibetan tradition and has studied with Lama Yeshe and Lama Zopa Rinpoche, as well as several other great lamas. Note: Each track averages about 60 minutes.